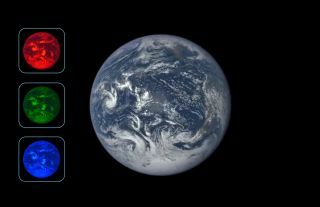 A new time-lapse videos combines 3,000 images from the DSCOVR satellite's EPIC camera to show a year of Earth's rotation, as seen from a million miles away. As an Earthling, it's easy to believe that we're standing still. After all, we don't feel any movement in our surroundings. But when you look at the sky, you can see evidence that we are moving. Some of the earliest astronomers proposed that we live in a geocentric universe, which means that Earth is at the center of everything. They said the sun rotated around us, which caused sunrises and sunsets — same for the movements of the moon and the planets. But there were certain things that didn't work with this vision. Sometimes, a planet would back up in the sky before resuming its forward motion. We know now that this motion — which is called retrograde motion — happens when Earth is "catching up" with another planet in its orbit. For example, Mars orbits farther from the sun than Earth. At one point in the respective orbits of Earth and Mars, we catch up to the Red Planet and pass it by. As we pass by it, the planet moves backward in the sky. Then it moves forward again after we have passed. Another piece of evidence for the sun-centered solar system comes from looking at parallax, or apparent change in the position of the stars with respect to each other. For a simple example of parallax, hold up your index finger in front of your face at arm's length. Look at it with your left eye only, closing your right eye. Then close your right eye, and look at the finger with your left. The finger's apparent position changes. That's because your left and right eyes are looking at the finger with slightly different angles. The same thing happens on Earth when we look at stars. It takes about 365 days for us to orbit the sun. If we look at a star (located relatively close to us) in the summer, and look at it again in the winter, its apparent position in the sky changes because we are at different points in our orbit. We see the star from different vantage points. With a bit of simple calculation, using parallax we can also figure out the distance to that star. How fast are we spinning? Space agencies love to take advantage of Earth's spin. If they're sending humans to the International Space Station, for example, the preferred location to do so is close to the equator. That's why cargo missions to the International Space Station, for example, launch from Florida. By doing so and launching in the same direction as Earth's spin, rockets get a speed boost to help them fly into space. Earth's spin, of course, is not the only motion we have in space. Our orbital speed around the sun is about 67,000 mph (107,000 km/h), according to Cornell. We can calculate that with basic geometry. First, we have to figure out how far Earth travels. Earth takes about 365 days to orbit the sun. The orbit is an ellipse, but to make the math simpler, let's say it's a circle. So, Earth's orbit is the circumference of a circle. The distance from Earth to the sun — called an astronomical unit— is 92,955,807 miles (149,597,870 kilometers), according to the International Astronomers Union. That is the radius (r). The circumference of a circle is equal to 2 x π x r. So in one year, Earth travels about 584 million miles (940 million km). Since speed is equal to the distance traveled over the time taken, Earth's speed is calculated by dividing 584 million miles (940 million km) by­­ 365.25 days and dividing that result by 24 hours to get miles per hour or km per hour. So, Earth travels about 1.6 million miles (2.6 million km) a day, or 66,627 mph (107,226 km/h). The sun has an orbit of its own in the Milky Way. The sun is about 25,000 light-years from the center of the galaxy, and the Milky Way is at least 100,000 light-years across. We are thought to be about halfway out from the center, according to Stanford University. The sun and the solar system appear to be moving at 200 kilometers per second, or at an average speed of 448,000 mph (720,000 km/h). Even at this rapid speed, the solar system would take about 230 million years to travel all the way around the Milky Way. The Milky Way, too, moves in space relative to other galaxies. In about 4 billion years, the Milky Way will collide with its nearest neighbor, the Andromeda Galaxy. The two are rushing toward each other at about 70 miles per second (112 km per second). Everything in the universe is, therefore, in motion. There is no chance that you'll be flung off to space right now, because the Earth's gravity is so strong compared to its spinning motion. (This latter motion is called centripetal acceleration.) At its strongest point, which is at the equator, centripetal acceleration only counteracts Earth's gravity by about 0.3 percent. In other words, you don't even notice it, although you will weigh slightly less at the equator than at the poles. NASA says the probability for Earth stopping its spin is "practically zero" for the next few billion years. Theoretically, however, if the Earth did stop moving suddenly, there would be an awful effect. The atmosphere would still be moving at the original speed of the Earth's rotation. This means that everything would be swept off of land, including people, buildings and even trees, topsoil and rocks, NASA added. What if the process was more gradual? This is the more likely scenario over billions of years, NASA said, because the sun and the moon are tugging on Earth's spin. That would give plenty of time for humans, animals and plants to get used to the change. By the laws of physics, the slowest the Earth could slow its spin would be 1 rotation every 365 days. That situation is called "sun synchronous" and would force one side of our planet to always face the sun, and the other side to permanently face away. By comparison: Earth's moon is already in an Earth-synchronous rotation where one side of the moon always faces us, and the other side opposite to us. But back to the no-spin scenario for a second: There would be some other weird effects if the Earth stopped spinning completely, NASA said. For one, the magnetic field would presumably disappear because it is thought to be generated in part by a spin. We'd lose our colorful auroras, and the Van Allen radiation belts surrounding Earth would probably disappear, too. Then Earth would be naked against the fury of the sun. Every time it sent a coronal mass ejection (charged particles) toward Earth, it would hit the surface and bathe everything in radiation. "This is a significant biohazard," NASA said. Cornell University's "Ask an Astronomer": At what speed does the Earth move around the Sun? NASA's "Ask the Space Scientist": What is the speed of Earth's rotation?